This is the personal account of me and my family's recent troublesome journey and treatment by Air Canada, when traveling home to Denmark after having spent christmas in Montreal, Canada 2015. 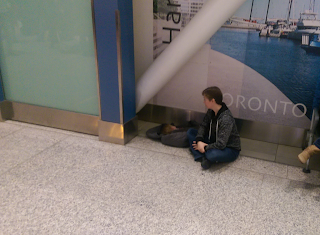 Toronto Pearson airport, my daughter sleeping in a corner while my wife is watching over her. Let me clarify that we are not unaccustomed to international traveling, having crossed the Atlantic at least 80 times over the previous 15 years. I’ve personally experienced my share of cancelled flights, delays and hotel stays etc., some of which I have even blogged about before. However, what I describe in the following takes the price as the worst travel experience ever, not least because it has to do with my infant daughter. I may get a detail or two wrong because of the stressful circumstances, but it has been written down a day after arriving home and cross-checked by my wife so can assumed to be quite accurate. My goal with this is first and foremost, to remember why Air Canada is never going to have me as a customer again and secondary as a base for filing an official complaint when I have recovered some energy.